Sharknado 3: Oh Hell No! is a 2015 American made-for-television action comedy horror film and the third installment in the Sharknado film series, following Sharknado and Sharknado 2: The Second One. The film was directed by Anthony C. Ferrante with Ian Ziering, Tara Reid, Cassie Scerbo, and Mark McGrath reprising their roles from the previous installments. Also joining the cast are David Hasselhoff, Bo Derek, Ryan Newman (replacing Aubrey Peeples in the role of Claudia Shepard, from the first film), and Jack Griffo. Irish music duo Jedward wrote and performed the film's official theme song "Oh Hell No", and also had a brief cameo in the film. The film premiered on Syfy in the United States on July 22, 2015. While sharknado fighter Fin Shepard is in Washington, D.C. to receive a Presidential Medal of Freedom from the president, another sharknado strikes, devastating the nation's capital. Fin and the president work together to defeat the sharks, and the storm unexpectedly subsides. Fearing that April, who is at Universal Orlando with their daughter Claudia and her mother May, is in danger, Fin heads for Florida. On his way there, he encounters a "fognado", which is stopped by Nova Clarke, his former employee, who has become a hardened sharknado storm tracker, and her partner Lucas Stevens. They stop at a military airport where they get clearance to use a fighter jet to bomb other forming sharknados. Lucas sacrifices himself to blow up a sharknado so that Nova and Fin can escape. They detonate a bomb in a sharknado over the Coke Zero Sugar 400 race. After crash landing in Orlando at the Universal Orlando Resort, they begin to search for the rest of the family. They are not able to get in touch with Claudia since she left her phone behind earlier, but April retrieves it from one of the ride managers who held on to it. Eventually, Fin and Nova reunite with April, Claudia, her new boyfriend Billy, and May who have survived the sharknado that has hit the theme park. They then rush to take cover inside the Universal Orlando globe, which rolls around admist chaotic fleeing crowds before coming to rest atop Pharos Lighthouse. Realizing that the numerous storms will soon combine into a massive sharknado wall that will destroy the entire East Coast (dubbed the "Feast Coast" by the media), Fin calls in a favor from his estranged father, former NASA colonel Gil Shepard, to help him with a risky plan to destroy the storm from space. Gil, Fin, April, and Nova reach Cape Canaveral where they plan to use a top-secret Space Shuttle to blow up tanks of rocket fuel in the storm. They head inside to prepare, while Claudia and Billy fend off incoming sharks by using guns. They share a kiss and begin to head back inside, but Billy is killed when a shark lands on him. While Nova clears a path, Gil, Fin, and April launch into space where they detonate the external tank, but it fails to stop the wall of sharknados. Gil deploys "Plan B", activating a Reagan-era Strategic Defense Initiative satellite laser weapon, stranding himself in space since there is not enough fuel to propel all of them back to Earth. This time, the sharknados are destroyed, but the beam causes the sharks to propel into space, attacking the shuttle. Fin fights them off using an energy-beam chainsaw; he and April are eaten by two different sharks which fall back down to Earth. Though the sharks are charred from atmospheric entry, Fin emerges from his shark unharmed and discovers that April also safely returned the same way, and that she had given birth during the descent. As the family and Nova reunite, Fin names his newborn son after his father, who has landed on the moon. April is about to recover Fin's father's badge when a Shuttle fragment apparently crushes her. Jack Griffo as Billy, a guy who befriends Claudia at the amusement park. Sharknado 3 was filmed on location at Universal Orlando, São Paulo Brazil, Northern New Jersey, San Juan, Puerto Rico, and Washington, D.C. The role of the President was written with former Governor of Alaska Sarah Palin in mind, but she declined. The part was then offered to businessman Donald Trump, but he declined the role due to him preparing a real presidential campaign. Rotten Tomatoes reports a 36% score with an average rating of 3.9/10, based on 33 critics. 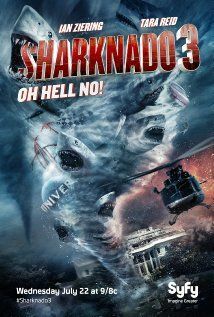 The consensus reads: "Sharknado 3: Oh Hell No! bites off more than it can chew, leaving viewers with an overlong mess that isn't even bad enough to be good." On Metacritic, the film has a score of 53 out of a 100, which indicates mixed or average reviews based on 19 critics. Brian Lowry of Variety said the self-reference gag was beginning to yield diminishing returns. He further added that the question is whether the parent company's insatiable appetite to cash in would hasten the feeding frenzy. Don Kaplan of The New York Daily News said the movie left a fishy taste behind. Neil Genzlinger of The New York Times said Sharknado 3's absurdities was turned to funny levels. He also said it was shameless in certain ways, with one being product placement. Matt Fowler from IGN said the film is surprisingly awful. A tie-in one shot comic, Archie vs. Sharknado, was released on July 22, 2015, by Archie Comics. Written by Ferrante and illustrated by Dan Parent, it depicts a Sharknado striking Riverdale. Sharknado 4 was confirmed to follow upon Sharknado 3's premiere. The film concludes with a cliffhanger leaving open the question as to whether April is killed by falling wreckage. An ad campaign that commenced after the film promoted a Twitter campaign offering fans the chance to decide her fate with the hashtags "#AprilLives" or "#AprilDies", with the results to be revealed in Sharknado 4. The fourth installment aired on July 31, 2016. A promotional trailer reveals that Ziering also makes an appearance as Fin Shepard in Lavalantula, which debuted on July 25, 2015, the Saturday after Sharknado 3's Wednesday premiere. This indicates that it takes place in a shared universe. As he says he has "shark problems right now", this may indicate that the events of Lavalantula take place just before or concurrent with Sharknado 3. Steve Guttenberg, the star of Lavalantula, appears in Sharknado: The 4th Awakens", reprising the role of Colton West in cameo; Michael Winslow also appears in both films, but as different characters. ^ Character name from the movie Animal House, in which "Babs Jansen" ultimately becomes a tour guide at Universal Studios Hollywood. ^ The scenes concerning Jared Fogle were cut from the SyFy broadcast following his legal issues prior to the film's premiere. ^ George Diller is the real-life public affairs announcer at NASA. ^ Bill Davis is the real-life president of Universal Orlando. He has a cameo as a greeter at the ticket gate. ^ a b Heidi Decker and Frank Kramer of The Heidi & Frank Show radio show on Dish Nation had cameos as radio hosts. ^ Juliana Ferrante is director Anthony C. Ferrante's daughter. ^ Petski, Denise (April 23, 2015). "Syfy Sets Summer Programming Schedule". Deadline Hollywood. Retrieved April 24, 2015. ^ a b "Mark Cuban to appear in 'Sharknado 3' ... as the president of the United States". ESPN.com. ^ a b c d Sarah Thomas. "Sharknado 3: Bigger than ever, but has this schlockbuster bitten off too much?". The Sydney Morning Herald. ^ "Thumbs up, thumbs down". Florida Today. July 23, 2015. ^ "Universal Studios Florida Shines in Sharknado 3". Coaster101. ^ "Heidi & Frank Appear on 'Sharknado 3!' - Dish Nation". Dish Nation. ^ Albert L. Ortega. "Premiere Of The Asylum & Fathom Events' "Sharknado 2: The Second One" - Arrivals". Getty Images. ^ "Ben Demaree DP - Sharknado 2: Behind the ScenesPetunia, a..." – via Facebook. ^ "'Sharknado 3: Oh Hell No!' Release Date, Cast". Christian News, The Gospel Herald. ^ AlloCine. "Sharknado 3 : Bruno Salomone rejoint David Hasselhoff chez les requins". AlloCiné. ^ a b "The Complete List: 55 Sharknado 3 Celebrity Cameos: Glamour.com". Glamour Magazine. ^ Stuart Heritage. "Jedward: saviours of Sharknado 3?". the Guardian. ^ Justin Harp (July 23, 2015). "These were the 8 most cringeworthy and laugh-out-loud outrageous moments from Sharknado 3: Oh Hell No!". Digital Spy. ^ "Everyone From David Hasselhoff to Anthony Weiner Is In the Sharknado 3 Trailer". IFC. ^ Abramovitch, Seth. "How 'Sharknado' Casts Its C-Listers and Nearly Landed Trump as President". The Hollywood Reporter. Retrieved August 2, 2017. ^ "Sharknado 3: Oh Hell No!". Rotten Tomatoes. Retrieved July 22, 2015. ^ "Sharknado 3: Oh Hell No!". Metacritic. Retrieved July 22, 2015. ^ Lowry, Brian (July 20, 2015). "TV Review: 'Sharknado 3: Oh Hell No!'". Variety. Retrieved July 25, 2015. ^ Kaplan, Don (July 14, 2015). "'Sharknado 3' review: Campy sequel with Ian Ziering is not jawsomely funny anymore". New York Daily News. Retrieved July 20, 2015. ^ Genzlinger, Neil (July 19, 2015). "Review: 'Sharknado 3,' on Syfy, Endangers the East Coast". The New York Times. Retrieved July 20, 2015. ^ "Sharknado 3: Oh Hell No! review". IGN. July 22, 2015. Retrieved July 22, 2015. ^ Whitbrook, James (April 17, 2015). "Archie Vs. Sharknado Is An Actual Comic That Is Actually Happening". io9.com. Retrieved July 20, 2015. ^ Wagmeister, Elizabeth (July 22, 2015). "'Sharknado 4' Announced: Director Anthony C. Ferrante Teases Details on Next Sequel". Variety. Retrieved July 25, 2015. ^ Lavalantula Promo - July 25 on Space. YouTube. July 15, 2015. Retrieved July 26, 2015. Wikiquote has quotations related to: Sharknado 3: Oh Hell No! This page was last edited on 20 April 2019, at 18:16 (UTC).